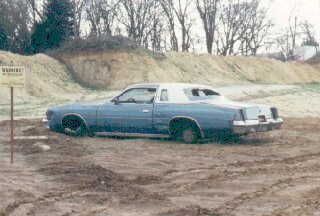 The Olds was left by its owner after an aborted attempt at four wheeling in a recently graded lot about 1/2 mile from the site where the Capri had been dumped. 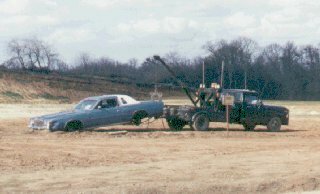 This one didn't deteriorate as completely as the Capri did, but I was lucky enough to catch the tow truck driver removing its remains. Thanks to Perry Nephin, I now have a positive ID on that "Olds/Chevy". Ok, I admit, I quit paying much attention to American made cars around 1968 (compare a 1967 Ponitac GTO to a 1968 one, and you'll see what I mean), so after that year, many makes and models just blend into this boring sameness in my mind. According to Mr. Nephin, I not only missed the manufacturer and model, I missed the manufacturing family! The car shown below is actually a Chrysler, a 1979 Cordoba, to be exact. Go here for verification. I am too lazy, however to change all the links and references to this page, so it will remain titled "olds.htm", sorry. 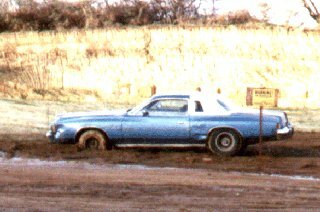 Stuck fast by the front wheels in mud. Windows are starting to break. I think that sign says something about no dumping of rubbish. 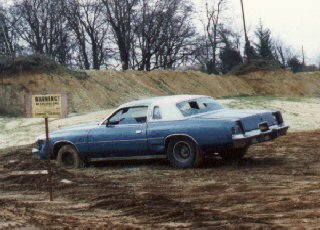 Evidently there are other people with poor taste in wheels, and one of them got these to customize his own GM... ok, ok, Mopar junker. On the way up to that big 'ol main drag in the sky, to cruise forever!